It was obvious to the Academy Shorts Branch which films were superior artistically at this point; Which “cartoons” should earn an Academy Award; Which films display craft, thought or an ‘intelligent’ laugh. And it’s slowly becoming obvious to the Hollywood studios themselves. Long just a local industry party, the Academy Awards had to “grow” during this new decade – or risk becoming irrelevant. This year another John Hubley film – one with a strong sense of humanity, and a biting comment on contemporary issues – took home the gold statue. It faced off against a witty comedy from Gene Deitch, the artiest Looney Tune ever from Chuck Jones, a Ludwig Von Drake lecture from Disney, and an adaptation of a Ray Bradbury story told via oil paintings, by the former UPA crew. Overall a fine selection of nominees. 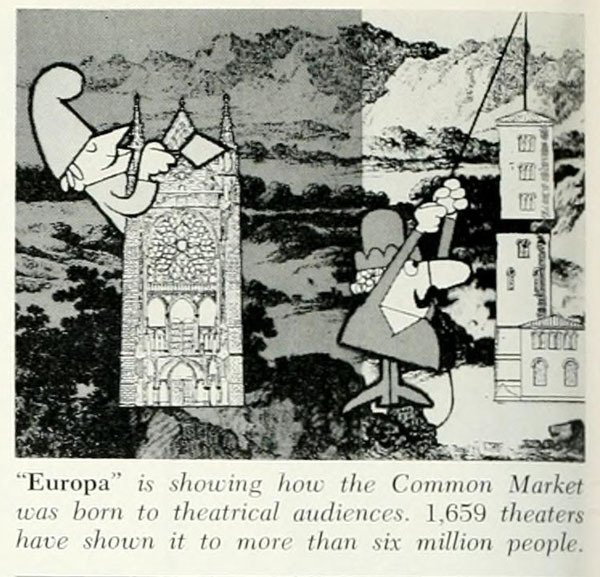 Bill Weiss must have assumed because Sidney was nominated once that he should keep sending these cartoons in to the Academy – regardless of quality. This print is particularly bad – and edited (its only 2 and a 1/2 minutes) – but you get the entire plot. Sidney (now voiced by Dayton Allen) is counting coconuts and dreams of getting a job as a circus elephant. He soon applies for a job which requires him to use his memory – to count coconuts! Sidney screams, “Put on the end titles!” – a line oft repeated, I’m sure, at Academy screenings when Terrytoons were submitted. 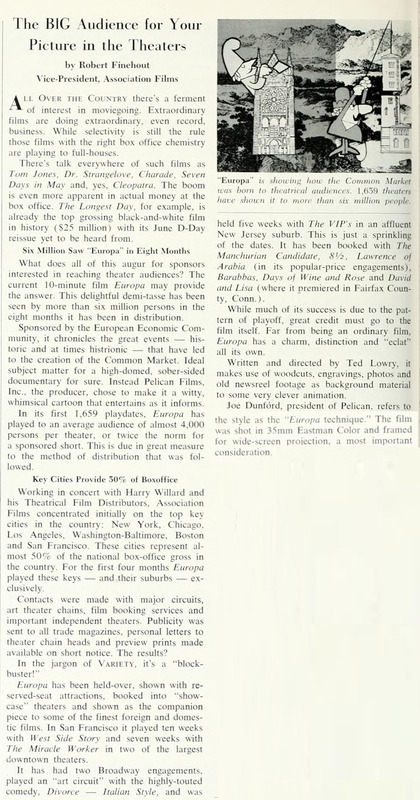 You can read more about the film in this article from Business Screen magazine (July 1962). Another short which is missing-in-action. An off-beat story of a little girl who refuses to “conform”, Barbara was written and produced by Bill Jennings (aka William Dale Jennings, author of the western classic, The Cowboys), Produced by Ralph Hulett (background painter for Walt Disney Productions), directed by Max Hutto (director of radio classics, including Fibber McGee and Molly) and narrated by Hans Conreid. 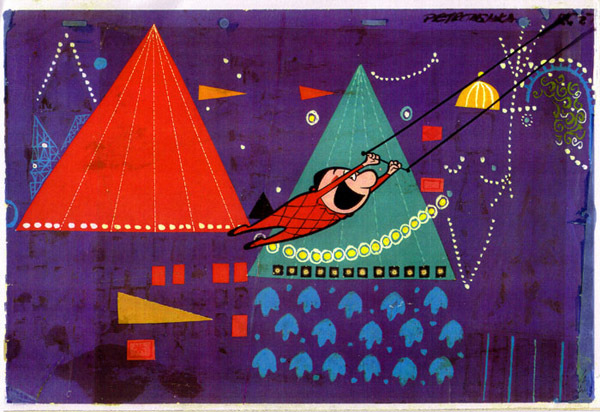 In 1960 Dale went to work for Hollywood Animators, working in the production of animated films. There he re-met Max Hutto, a former radio director whom Dale had known while with Ice Capades. Dale showed Max a script for a little film held written called Barbara. Max read it overnight and said Lets shoot it, and they did. They used an animation camera at night and shot it with cartoon drawings that Dale did himself. It took several weeks and $2,000 and it won lst Prize in the Palo Alto Film Festival. That was the beginning of a long friendship and profitable partnership for Dale and Max and Ralph Hulett, the famous California watercolorist. They left Hollywood Animators to start Interlude Films, which Dale describes as a company that made little films to be used in the interlude between features and coming attractions. Interlude also made TV commercials, documentaries, educational films and industrial films. A synopsis for the film says that: “Barbara is a young girl who makes the painful discovery that she is just like everyone else. Her one dominant desire is to “be somebody”, but she really doesn’t know how this can be done”. She tries to be “a leader”, but becomes dissatisfied with that and then tries to separate herself from the crowd – but soon ‘the crowd’ attempts to be more like her. Sage advice from her uncle – that she is already “somebody” – satisfies Barbara to ‘be herself’. The film was seen non-theatrically – mainly used in high school classrooms – for many many years. If anyone locates a print, we’d be happy to share it here. Pintoff designed, directed and composed the score for this short, conceived and designed by Len Glasser. Former Terrytoon artist Vinnie Bell animated the film and the ubiquitous Dayton Allen does the voices. This film has its charms, but its part of a trend (led by Pintoff himself) of post-UPA cartoons (by ex-UPA animators) in-search-of an audience, outlet or purpose. Hubley and Deitch seem to have it figured out. As for Pintoff, he was a force to be reckoned with – and he’d hit pay dirt next year (tune in next week). Another film from a few years past was submitted this year for nomination. Les Astronautes (1959) was produced by Anatole Dauman of Argos Films (Paris), distributed in the U.S. by Janus Films. It would appear an 8 minute version of the film was submitted to the Academy. A collaboration by Polish filmmaker Walerian Borowczyk and French director Chris Marker – about an inventor exploring space and the world around him – told using various techniques including collage, pixilliation and animated still photos. 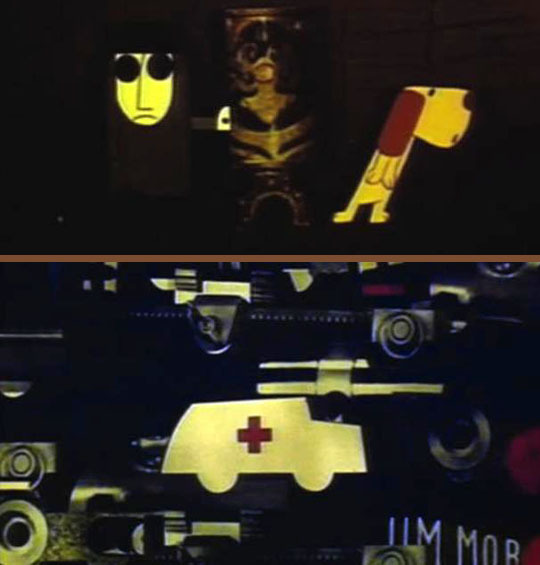 Terry Gilliam was inspired by this short, and one can see its influence on Yellow Submarine. And finally, a Zagreb cartoon which, through patterns of collage and paint, explores the theme of “alienation in an industrialized area”. A blind man with a music box loses his dog. He puts an advertisement in the paper which brings no result. Meanwhile, the dog is mistakenly put to work on an assembly line – and no one notices. This one is not available to screen – any guidance by our readers to point us towards a copy of this film is appreciated. The earlier posts in this series: 1948, 1951, 1952, 1953, 1954, 1955, 1956, 1957, 1958, 1959, 1960 and 1961. Being the year of the Cuban missile crisis, THE HOLE was the obvious choice. Too bad EVERYDAY CHRONICLE was not included among Rembrandt Film’s great DVDs on Zagreb. -Louvre Come Back to Me! On “Barbara”, most of the people involved (including Dale Jennings), were involved with 1963’s “cult” film narrated by Edward Everett Horton “One Got Fat” – with goofy live action pre-teens, tweens and teens in chimp masks on bikes, to see if they’re able to ride to the neighborhood park in a proper and safe fasion. That one had a lot of the old Capitol/Seely stock music library cues familiar from so many of the old shows. 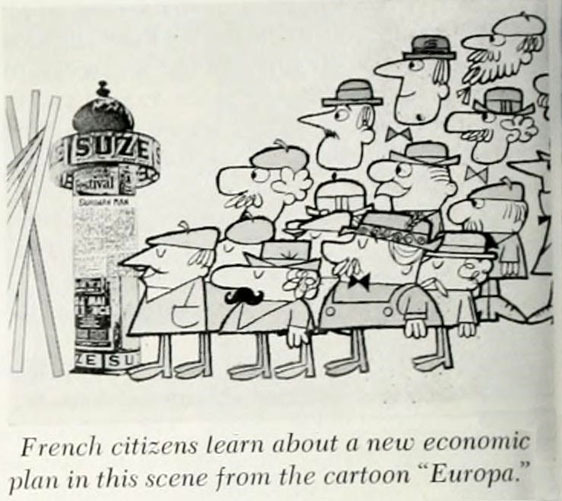 Personally, I think Banty Raids should have gotten the nod for best animated short of 1962! It was one of the craziest Foghorn Leghorn cartoons ever with that li’l beatnik bantamweight going gaga over the hens but had to keep his cover as a baby so Foghorn wouldn’t find out who he really was. It’s a Croatian print from a talk with the director, and it’s shot directly from the projection screen (also a bit cropped). Sadly, I know no Croatian, but it has other films by him if anyone has the time. Wonderful! Thank you for finding that link! Petrouska was a striking piece of animation, with beautiful designs and better than average animation complementing Stravinsky’s score. Had it been submitted back when it was made before airing on television, it likely would have been nominated. I bet, too bad John Wilson didn’t think to do so himself. His stuff needs to see recognition someday. Did Stravinsky have any comments about this one? I’m guessing he was kinder than he was to “Fantasia”, seeing as how he appeared to be more actively involved. I suppose we’ll never know what he thought. The narrative still felt pretty honest to what Stravinsky had in mind. The late Michael Sporn posted about the film and included a few articles relating to it. What? No Loopy De Loop? No Speedy Gonzales? MEXICAN BOARDERS is better than THE PIED PIPER OF GUADALUPE. Will you be including Jan Lenica’s Labyrinth in your Cartoons Considered For An Acadamy Award-1963 article,Jerry? And second… what is included each week (each year) is not up to me. It’s up to whether or not the film was actually submitted and qualified for being screened for the nomination. I will tell you that Jan Lenica’s Labyrinth was not submitted in 1963 – and will not be featured next week. I’m surprised Lenica’s ‘Labyrinth’ wasn’t nominated for Best Animated Short. Like ‘The Astronauts’,it obviously influenced Terry Gilliam,and the short itself shows the influence of Max Ernst and Hieronymus Bosch. Weird mental connection: When the beatnik rooster in “Banty Raids” did his Elvis impression, I immediately had a flash of Bugs Bunny doing to same moves to the same music. I’m thinking the original “Bugs Bunny Show”. Yep – you’re thinking of the episode where’s Bugs’ singing & Daffy’s playing keeps Yosemite Sam awake – it’s an 1st Season episode. The song itself was an actual tune that came out around that time, made somewhat popular (or not) by Frankie Avalon. 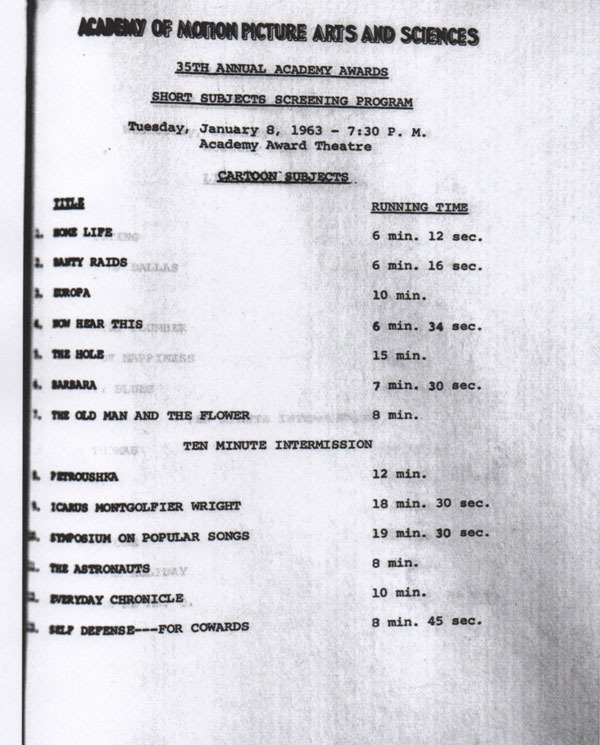 I wonder if any of the screening sheets for years before 1951 will surface in the future. The shorts screened for this year are a lot more interesting than those of last year. I wonder what shorts were screened for the year 1950. 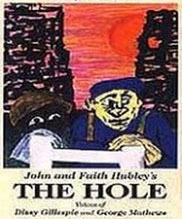 I saw “The Hole” last year on the big screen, at a Hubley retrospective at a local theater, along with “Moonbird” and several others. Hub’s son (who provided one of the voices in “Moonbird” along with his brother) was at the showing answering questions.